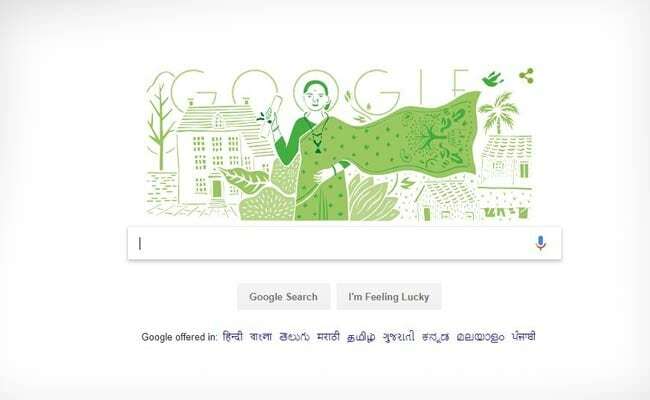 Google Doodle on Anandi Gopal Joshi's 153rd birthday: Anandibai Gopalrao Joshi was the first Indian female doctor and woman to obtain a degree in western medicine. New Delhi: Anandi Gopal Joshi defied all odds to become India's first female doctor. Anandi Joshi was born as Yamuna on 31st March 1865 to a Brahmin family settled in Kalyan in present-day Maharashtra. Keeping with the practice of that time, Yamuna was married to a widower, almost 20 years her senior, at the age of nine. She was renamed Anandi after her marriage. When she was just 14, Anandi gave birth to her first child, a boy. Unfortunately, he didn't live beyond 10 days due to the unavailability of medical care he needed for his survival. This incident changed Anandi Gopalrao Joshi's life forever and inspired her to study medicine. Her husband, Gopalrao Joshi, encouraged her to study. In those days, it was common for Brahmins to be proficient in Sanskrit. But being a progressive thinker who supported education for women, Mr Joshi regarded learning English to be a more pragmatic choice. He encouraged Ms Joshi to pursue her interest in medicine. Although Anandi Joshi was battling ill-health, she set sail for America all by herself, chaperoned by two female English acquaintances of another physian couple Thorborns, who were known to the Joshis. This was not perceived well by the Hindus who censured her immensely. The Christians supported her and wanted her to convert to Christianity. But, in her community address at the Serampore College Hall, she spoke about the persecution she and her husband had endured. She stressed the need for Hindu female doctors in India and also pledged that she would not convert. Her speech was well received and financial contributions started pouring in from all over India. Once in America, Anandibai wrote to the Women's Medical College of Pennsylvania (now known as Drexel University College of Medicine), asking for admission to their medical program, the second women's medical program in the world. Rachel Bodley, the dean of the college, enrolled her. Anandi Gopalrao Joshi began her medical studies at the age of 19 and graduated with an MD on 11 March, 1886. The topic of her thesis was "Obstetrics among the Aryan Hindus". Queen Victoria congratulated her on her graduation. Anandibai returned to India, amid grand celebration, in late 1886. She was appointed as the physician-in-charge of the female ward of the local Albert Edward Hospital by the princely state of Kolhapur. While in America, she had contracted tuberculosis because of the cold weather and unfamiliar diet. She died 26 February, 1887 before turning 22. Anandi Gopalrao Joshi's death was mourned throughout India. Google today honoured Anandibai Gopalrao Joshi with a Doodle for inspiring women to be educated and for being the first Indian woman to obtain a degree in western medicine.